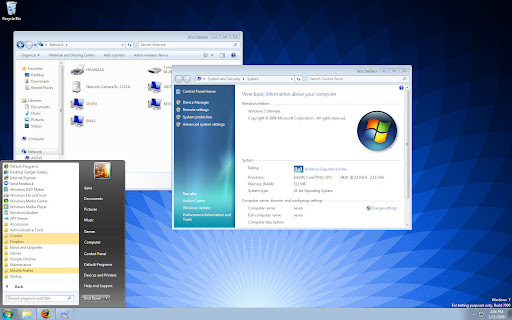 Got a hold of the Windows 7 beta ISO image to try it out. I fired up a Virtual Machine and booted off the image. The install is more graphical and polished. Very easy guides take you through a simple install. A couple of reboots later (required by the installer) and the system came up fine. My first order of business was to install Google Chrome... an easy and sure way to get into the Internet. Next was Dropbox, a free web based storage system where I keep part of my movable configuration. Once I had access to my Dropbox folders I installed FireFox 3 with the FEBE extension. Moving my entire FireFox 3 environment was easy. So far no glitches... everything working fine. Started browsing the web and using it as it was a new PC. There are a few nicities here and there, and overall it feels faster and more responsive. Even running inside a VM it performs well. I've not tried any games or large applications. The User Interface looks clear and more intuitive. The new status bar is nice, I could easily get used to it.